I've received Bestowed boxes before and thought they were a great value. And I love getting prizes in the mail (as my Amazon account would clearly display), so these box subscriptions are right up my alley. What I liked about Bestowed is that you're getting a box full of interesting culinary snacks that are healthy and wholesome. This month I received a special shipment from Bestowed in celebration of non-GMO month. GMO or genetically modified organisms mean the DNA of the food has been tinkered with and splices with bacteria or viruses. There's a lot of controversy about if it's ethical to manipulate genes like this, if it's safe for humans to consume and how this stuff should be labeled. So in honor of shedding light on this issue, Bestowed put together a box of awesome snacks that are complete devoid of GMOs. Plus, it's delicious. 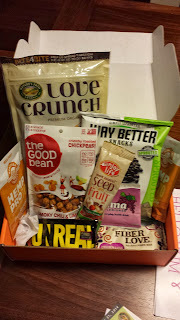 Just like my last shipment from Bestowed, this is a well-rounded assortment of sweet and savory snacks that represent lots of healthful additions I wouldn't normally pick up. I'm excited to try the hemp protein as well as the ultima electrolyte powder. So ar, we've cracked into the dark chocolate macaroon granola (as heavenly as you can imagine) and the Unreal peanut butter cups. All I'll say is they're are quite aptly named. Disclosure: I received this box for free in exchange for my review, but my opinions can't be bought.